02/01/13 - Reformatted web page. Before we get into putting a build specification together, let's define what one is. Basically, a build specification is a vision, your vision, of what you want your Cobra to be when you're finished. It's also a roadmap for making individual project decisions over the course of construction. That doesn't mean that you put one together and never change it, but taking the time to put one together will help assure you that your finished Cobra will be everything you hoped it would. It will also help you avoid filling up your garage with a bunch of unused, expensive parts. To start a project like this without a build specification is like building a house without a blueprint. 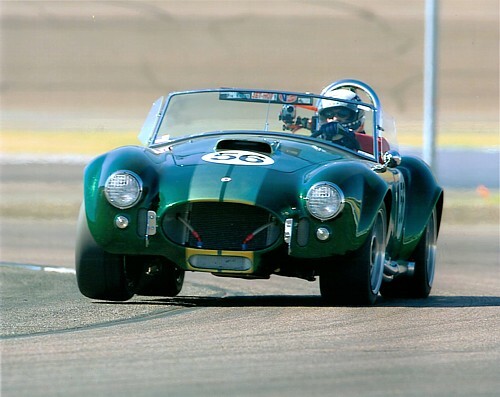 You probably wouldn't do that, and it's not a good idea when building a Cobra either. Okay, so we agree we need a build specification, so how do we go about putting one together? First, decide on a tool for capturing your decisions. I put my decisions into a MS-Excel spreadsheet where I also keep track of my expenses as well. Use whatever tool you have or are comfortable using. At the end of this chapter, I'll share with you my build specification document. To start my specification, I asked myself four framework questions. One, how do I intend to use the car? Two, what visual style am I after? Three, what final finish do I want? Four, how much power do I need/want? Find your answer to these four basic questions and you'll be well on your way to establishing your framework. Let's look at each question in more detail and explore how to answer these questions to fit your specific situation. Keep in mind that what’s written below are simply my opinions on what I want to build. I’m not trying to tell you what you should build nor am I insulting anyone’s ride if you went in a different direction than I chose. All Cobras are good in my book. Use is referring to how I plan to drive the car. Is this a daily driver, a weekend cruiser, a track car, a trailer queen show car, or something in between? This is probably one of the more important questions to get right because it leads to so many decisions regarding chassis set up, suspension options, build features, power, tires, etc. Get it wrong and you will waste a lot of money. Remember that if you want to "track" your car, the SCCA has some rules that will affect your build like roll bars, restraint systems, etc. These are easier to do during the initial build than trying to retrofit later. For me, this was an easy decision. My Cobra will be a weekend cruiser for me, the wife, and my kids to enjoy. It will have a touch of show car built in, but not enough that is discourages me from driving it. I will typically drive it only on nice days and not for terribly long distances. I don't have any desire to drive uber fast or to track the car. I'm a little old for that and besides, I used up all my testosterone (and money) in aviation! Visual style is important because it provides a unifying theme that guides all your detail decisions concerning visual appearance. Am I after the authentic Cobra look, a custom rod look, or something off the wall that just resembles a Cobra? 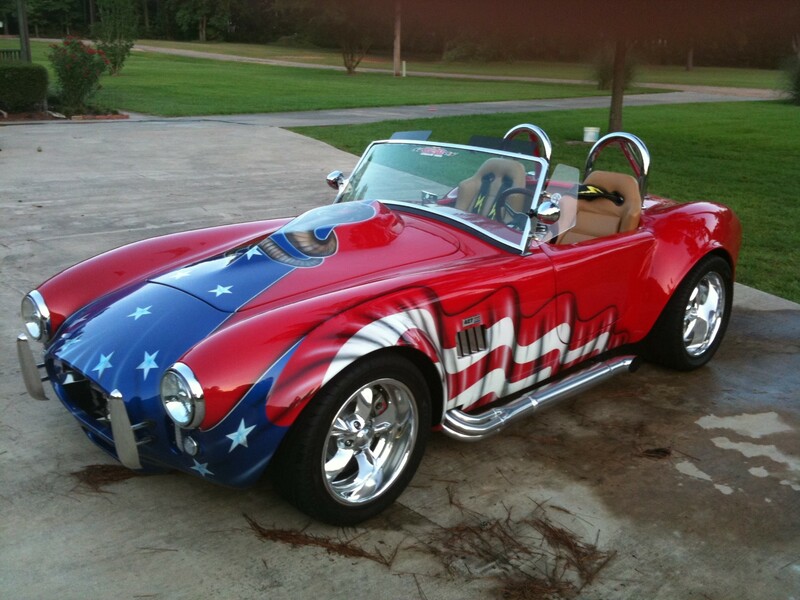 I've seen some really wild customs based upon the Cobra body but that's not quite what I'm after. Besides, this is not a strict show car and I don’t plan on chasing trophies. I also am not interested in the authentic Cobra look either. 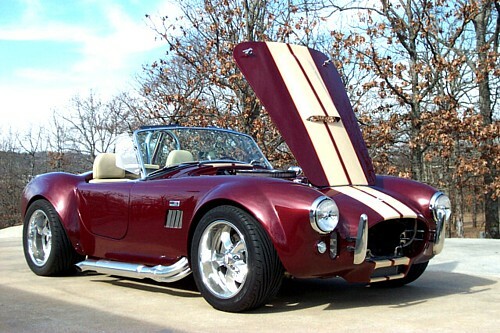 There are a lot of stupid arguments on the Cobra Forums about whether these cars are "real" or a "replica", etc and I don't even want to get sucked into that dumb argument by trying to emulate an authentic 1966 Shelby 427SC. Besides, I don't really care for the look of the 15" Halibrand knock off rims and white lettered tires. It's too retro for me. I want more of a custom rod look and feel while retaining the traditional Cobra body look. I refer to this as the “custom Cobra” look. This frees me up to experiment with a lot of other options like engine, interior, sound, rims, tires, and paint. I want to capture the general look of a Cobra but with the convenience of modern technology. The finish of the car is basically a question of money, but it is also a function of use as well. If you are doing a daily driver, it wouldn't make much sense to spend big dollars on a high-end paint job. If you are tracking the car, a can of primer is all you may need. Since mine is a weekend cruiser I can go inexpensive and simple, expensive and elaborate, or somewhere in-between. My past experience in aviation has taught me that resale value is directly proportional to the paint job. I plan on a professional paint job, not one that I will do at home. I also like my projects to have a little extra than the next guy so I’m planning on some airbrush work that for now will remain secret. I have already picked the primary color of the car but the trim colors are still undecided. Overall, I would say my finish decision is a notch or two under “show quality” and several notches above your average Blue with dual White stripes (not that there’s anything wrong with that!) I’ve budgeted around $7K for the prep, paint, and artwork. Ah power, isn’t that one of the reasons we choose to build a Cobra? Here’s where some of the previous framework decisions interact with personal choice. 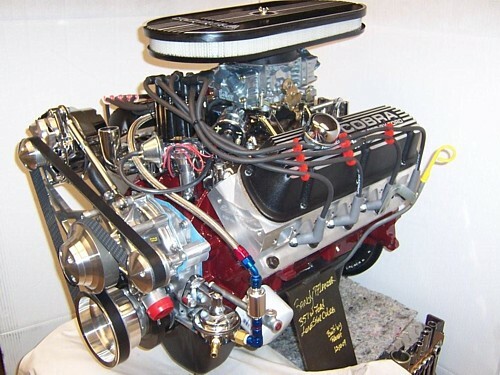 Basic choices are big block or small block, and which make (Ford, Chevy, Chrysler, or other). If you’re going for the replica look, then you will probably want a 427 FE sideoiler or at least, a newer 428. Most people consider it sacrilegious to put anything other than a Ford under the hood but there are a fair number of Chevy drivers out there. I talked to a guy in Dayton Ohio who has a Cobra with a Viper V-10 engine in it! Use also plays a role. If you are driving around town, you will want something that is dependable, easy to clutch, and won’t scare little children. If you are going to the track, the more HP you can get down to the rear wheels the better. This is one area where your options are virtually unlimited based upon personal choice and wallet size. Since I want an easy driver and dependability, I’m going with a Ford 351W engine bored and stroked to produce about 425 HP and 400 ft/lbs of torque. For as light a car as the Cobra, this combination will still be scary fast but easier to maintain than a big block. Again back to style, I don’t care that I don’t have a 427 under the hood. Noise is also a consideration and I’m not interested in telling my neighbors 5 miles away that I’m out for a cruise. The small block should work just fine for what I want and in the end, probably won’t affect resale value much. Remember that this document is a living, breathing document and I change it often. What you download now will likely change over time so keep that in mind if you chose to use it for yourself. I'll try to keep the updated version posted to the web. So, the framework is established. Now it's time to start ordering stuff and making decisions about who to buy from. That's covered on the next page.